I believe the functioning and the prospering of an uncorrupted and progressive listener supported public radio station is of the utmost priority in these extraordinarily troubled times where we see racism, sexism, unbridled privilege and increasing inequality (with concurrently decreasing democracy), et.al. again on the rise, while the aspirational ideas and principles upon which the United States was supposedly said to be founded are being set aside- as well as the very conc of Truth itself. The threats and subversions we see come from those at the pinnacles of power and the top of this country’s government (contravening oaths of office and every sense of duty). Therefore, I am submitting myself as a candidate for the WBAI Local Board. 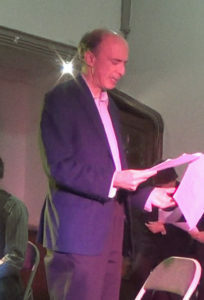 As an actor and playwright (and member of the actor’s unions for three decades) with a additional background in journalism, as well as a knowledge of history, I would hope to expand the stations’ outreach to the arts community at large, and to help foster the growth of its news coverage with (hopefully) more capacity for investigative reports. I would also hope to bring a rational perception of specific issues integrated with an overview of the ‘big picture,’ as well as a fundamental sense of what a publicly supported radio station can and should offer to its listeners, both current and potential. I would be firmly against the sale and/or diminishing of the station (including any surrender of its valuable signal)- and, thus, in essence, the diminishment of the people it is the station’s purpose to serve. I am, instead, firmly committed to seeing the station grow and enhance its capabilities and its contributions to our society and the local New York metro area communities that need what the station can offer now more than ever. The station has always grown and attracted additional listeners and listener support in times with special challenges such as we now face. Our famous past must be prologue: We need to be stepping up to fulfill the important responsibility of meeting the opportunities the current challenges present. It’s especially clear that right now the times are crying out for what WBAI is and can be, especially when it thrives, grows strong and meets the current crises that sorely need to be addressed.